While hiking above Steamboat Springs with my daughter, Rachael, we were unable to cross a stream until we saw a recumbent tree spanning the gorge. She said, “It’s like the tree laid its life down for us.” This theme is now available at our spring shows. Five great shows to start 2018 were all ranked in the top 50 in the nation for 2017! Awarded Best Booth in Show at Chastain Park Art Festival with 200 nationally juried artists held in Atlanta. 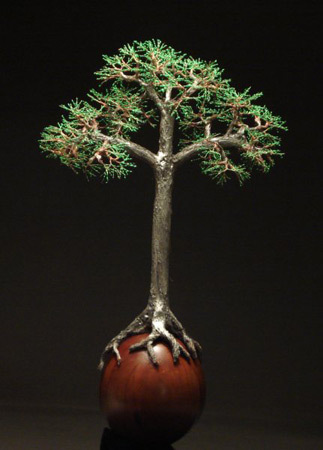 Chosen for Award of Distinction in Sculpture at the Under the Oaks Art Show in Vero Beach, Florida. At the recent Springfield Old Capital Art Fair, the director was honored with a choice of a piece of art from any of the 160 show artists. 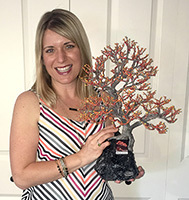 Kate Baima chose one of my sculptures. Heart on Fire depicts unending joy and passion. It fits her well. Wayne has been chosen to be the Juror for a national art show competition of Noticing Nature, a competition with 278 entrants vying for awards and a month long display at the Foundry in St Peters, Missouri. 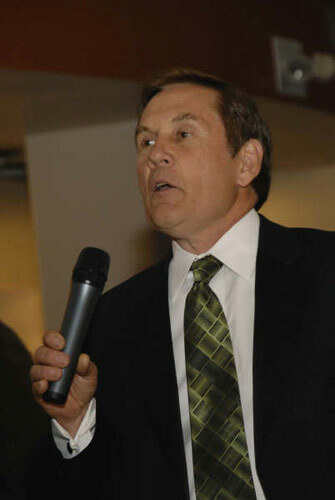 He will announce the winners at the opening reception on January 29th. At a recent Des Moines art show a man appeared in my booth and was studying my Big Hearted Oak. I spoke of its leadership qualities and mentioned that it was on the desk of 4 Governors. “Well, I’m a Governor“, he exclaimed, “Could I buy one”? 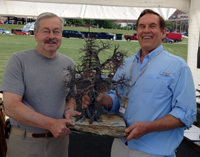 So multi term Governor of Iowa, Terry Branstedt, became the 5th to own this smiling leader tree. And I felt joy to meet him. 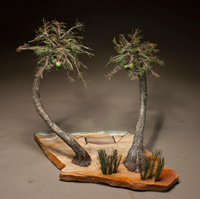 Margarittaville is a new sculpture commissioned by a guy who loves the feeling of sand, sea, and a hammock be tween a couple palms. I was selected as a spokesperson for the upcoming Belleville Art on the Square( #2 ranked show in the nation). An insightful video was made of me and my work. In 6 minutes it tells the story of my work. CLICK HERE TO WATCH THE VIDEO. My Second Chance sculpture was selected as a major purchase award and donated to the new Lindenwood University. It is a story of new beginnings. 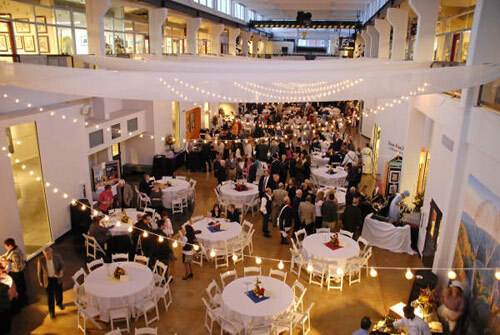 At the highly ranked Gasparillo Art Festival in Tampa with 250 nationally selected artists I Knew there was no possibility of winning an award. So even though I was handed an invitation to the award ceremony, I skipped it the celebrate my birthday and a couple beers with my son at a bistro. 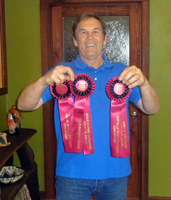 Upon returning to the show the next morning I was astounded to have received 3 awards! They were given by 3 of the major show patrons who each selected my work as the pieces they wanted in their homes. This was an honor which surpassed even my dreams. After another record breaking sales year, we are starting this spring with a bang! Our first 5 shows are all ranked in the top 30 shows in the nation.We have been working hard to create new trees for this challenge. Can’t wait to see you at a show! 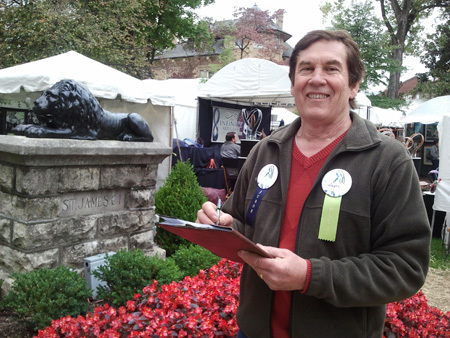 Wayne was the featured artist and spokesman for the Talbot Street Art Fair in Indianapolis. His TV interview allowed him to speak of the motivation and joy an artist can find in his work. “The Powerline Tree” is introduced. This tree speaks to the righteous indignation displayed by the arboreal creature who was thoughtlessly maligned by the tree trimmers in its youth for the sake of the utility company’s purposes. Though physically scarred its spirit lives on, and inspires us to do better in the future. For his effervescent daughter’s upcoming wedding to her tall, quieter beaux, Wayne created Winter-Spring. 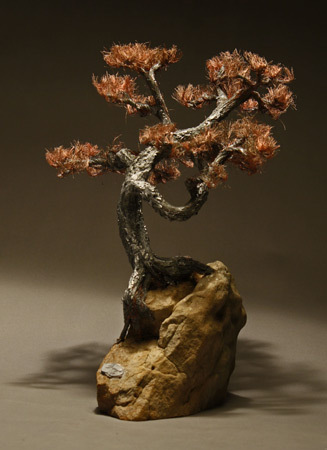 In this piece, a stately pine overshadows and protects a dancing, sparkling Dogwood. 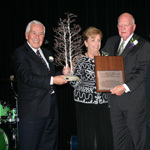 Wayne was commissioned to create a Lifetime Achievement Award for longtime US Senator Richard Lugar. He made a pair of Birches to symbolize the productive energy for our country’s good which was facilitated by the relationship of Senator Lugar with his wife. Won Best of Show Award at Park City Kimbal Art Show , a show ranked in the national top 10 art festivals . 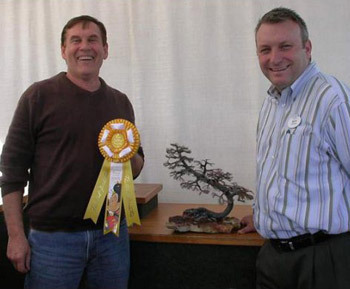 This unbelievable honor was his third Best of Show recognition for 2013! What a year of blessings!! 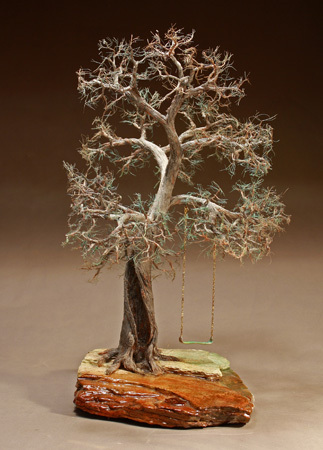 Along with 150 artists at the nature themed art show at the Chicago Botanic Gardens, Wayne showed his trees and was awarded First Place in Sculpture. Placed next to an aspen grove his aspen sculptures were particularly “popular”. 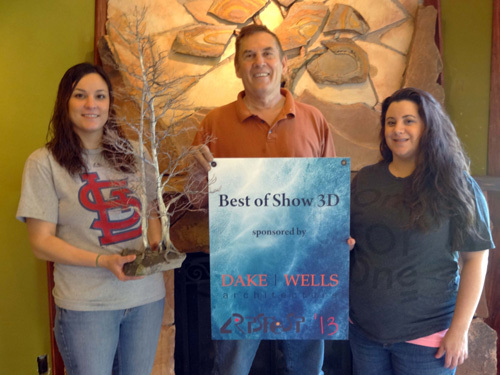 At the recent historic Artfest on Walnut Street in Springfield , Missouri I was very happy to receive the Best of Show in 3D Award. My assistants, Andrea and Hannah were very proud of our newest work with trees finishing. May 4-5 Springfield, Mo - Artfest on Walnut St. It was a great honor for Wayne to be asked to judge metal sculpture at the # 1 ranked art show in the nation. The King James Art Festival in Louisville asked him to evaluate the work his peer artists. 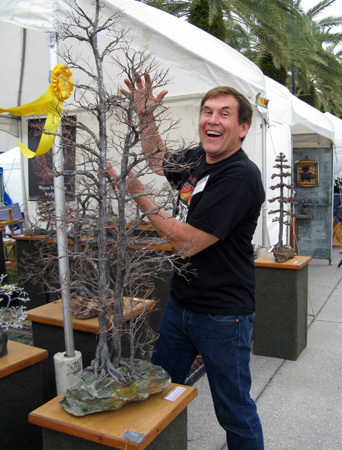 At the Halifax Fine Arts Festival in Daytona Beach Wayne won first place in sculpture for the second year in a row. The one on the Way sculpture was purchased by a man with a smile as big as the artist’s. The Spring schedule is posted and includes 5 shows which are ranked in the top 30 in the country. This years schedule will eventually include art shows in 10 States. We are very busy, and we love it! In this page we will try to keep you abreast of the latest trees, newest developments, upcoming shows, and an inside view of the business. We hope to include feedback from customers. Click "like it ‘ if you find it helpful. Stay tuned for a new Golden Series which show trees presented with leaves of gold leaf to flash brilliantly in the light. See the example of the Golden Ginkgo. More trees are being developed. Wayne was selected to be featured in the cover story for Sunshine Artist Magazine, November edition. 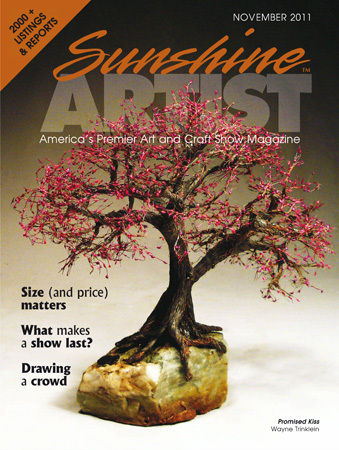 This is the #1 trade magazine in the nation and has 30,000 artist readers. Check it out! "I was called by the editor of Sunshine Artist out of the blue, and asked to speak about my work for an hourlong interview. This 5 page cover story, pictorial article is a well written and accurate depiction of the motivation and joy I find in my work. 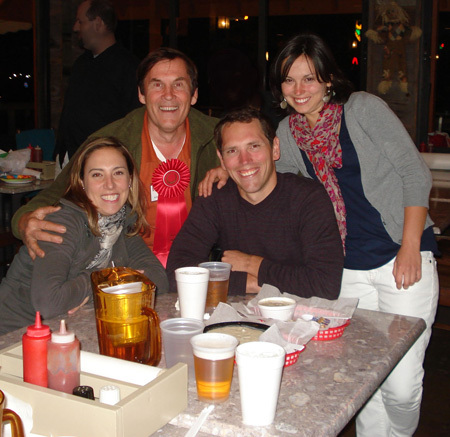 It tells of an unexpected career and helps clarify why I feel so blest through my wife, family, and friends." Wayne has 3 more great shows this year on his schedule! He was invited to show in the Festival of the Masters, a juried exposition where applicants need to have won a major award at a major art show just to be considered for acceptance. 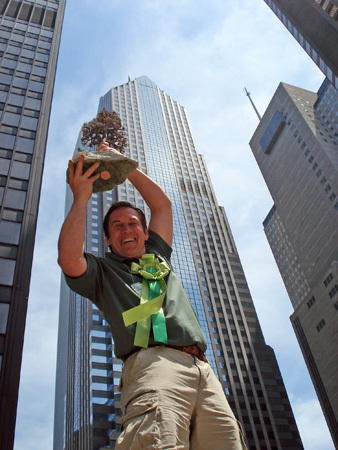 Wayne hams it up in the Chicago skyline after taking the First Place Award for Sculpture at the Millennium Art Fair. 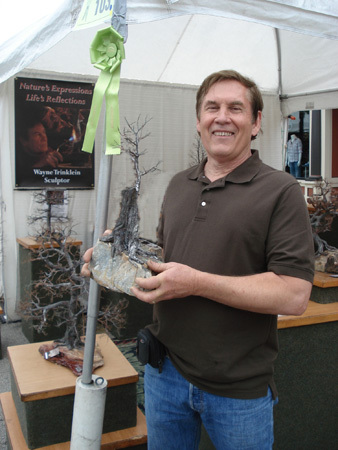 At the Barrington Fine Art Festival Wayne received a sculptural Award. 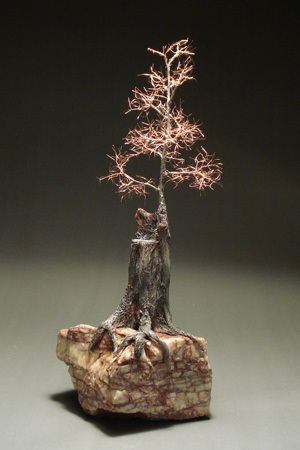 He introduced , Jesse’s Stump, a new sculpture portraying hope, patience, and promises kept. 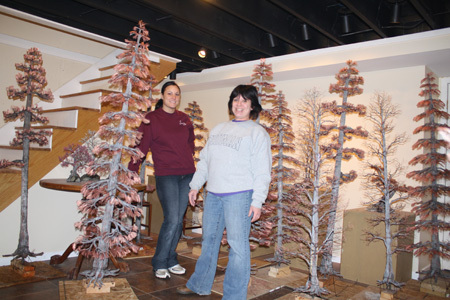 We completed most of our Winter special large orders including this group of 6 foot trees shown here with my assistants, Andrea and Karen. This has been a phenomenal year at shows for 2011, nearly selling out in Florida, Houston, and Kansas City. But we are working hard at rebuilding our stock, and have a great new selection to offer at our Spring/Summer shows (see Show Schedule). We have been invited to many top nationally ranked shows. We hope you can attend one of these great shows in your area, or just give a call with your needs. We have worked hard all winter. My Spring season starts out with a bang with shows in Florida, Houston, Michigan, and Kansas City. My gallery has a great selection of new sculpture. 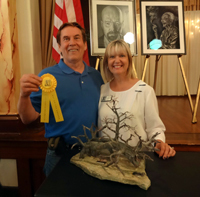 At the Halifax Fine Art Show in Daytona Beach, Florida, Wayne was awarded the top award in Sculpture.His children, Rachael, Noah, and a friend helped celebrate afterwards. The Big Hearted Oak has become a very popular Signature tree. It show a tree enjoying its playful side after a lifetime of service. 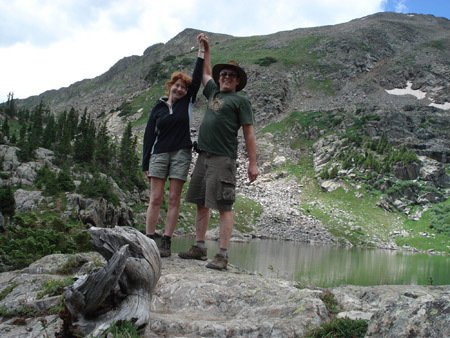 Wayne and Susan had great shows in Jackson Hole, Wyoming and Beaver Creek, Colorado. His sculptures will be seen there in extraordinary nature galleries there amidst first class fossil and mineral displays. 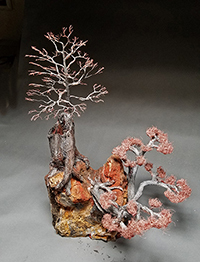 (See http://www.bynaturegallery.com/). 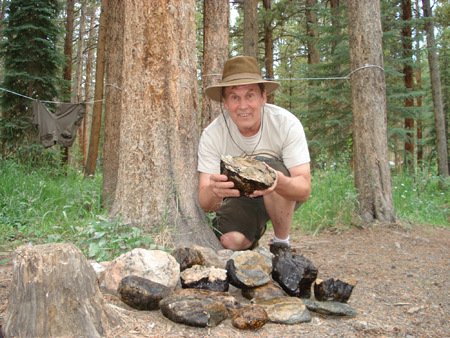 Between these two art shows they climbed the peaks of three mountains and returned to base camp tired, but with packs filled with beautiful rocks for future trees. 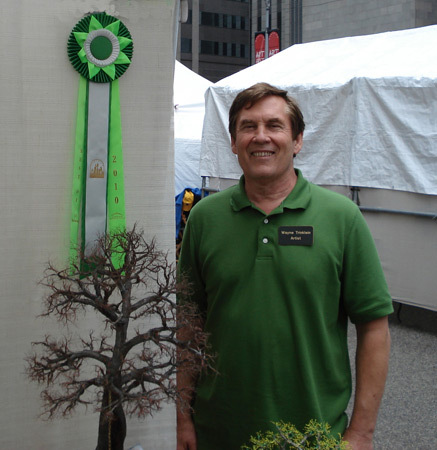 At the Chicago Eastside Millenium Art Fair on Michigan Avenue near "The Bean," Wayne was honored with the First Place Award for Sculpture. 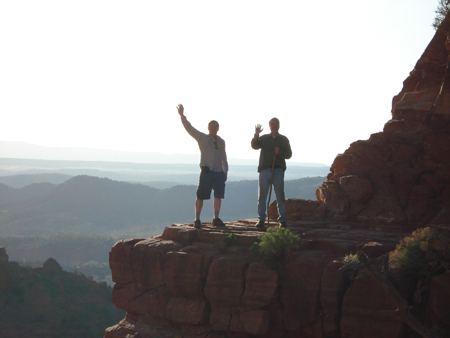 During this spring’s Artist in Residence in Sedona, we hiked Red Rock country. Our friend , Brad accompanied us on a particularly spectacular climb to the summit of Cathedral Rock. The trail was steep with the need to find hand holds and creases in the rock face to proceed. It was there that we met a necessary creature, an old conifer, along the route. I reached up to its extended limb, and found the bark worn smooth from the grip of countless trekkers.. 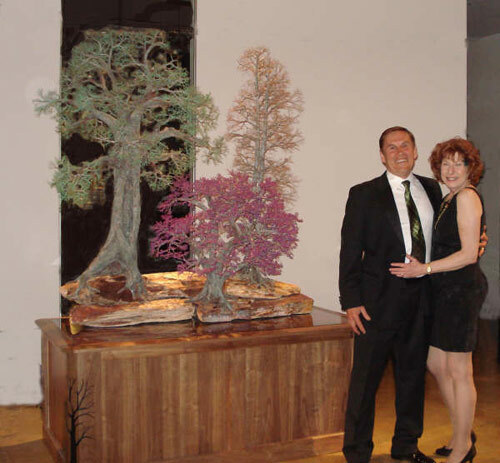 This experience inspired my newest Signature tree sculpture, the Helping Hand. Introducing a new sculpture, called Heart on Fire. Purchase Award by Walt Disney Corporation – Wayne Trinklein was selected to show at December 2010 Downtown Disney’s Salute to the Masters. At that show he was chosen for Disney’s Purchase Award to be displayed in the headquarters building. Disney Vice President Tim Bradford personally picked the adventurous and playful Cedar by Water’s Edge. 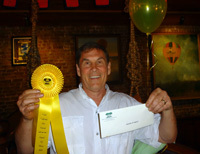 Wayne won First Place in Sculpture at the Cedarhurst Art Fair in Mt Vernon, Illinois. This was followed by a commission by the Good Samaritan Regional Health Center for a group of trees to honor the Directors and Board of Trustees. Edens Theological Seminary commissioned a processional cross consisting of a “Tree of Life” crucifix mounted on an orb of cherry wood to be used in the student chapel. A dedication ceremony will be held at the Edens Chapel on November 2nd. Post picture of cross. A new sculpture, the “Impossible Dream“, is introduced on www.waynetrinklein.com site. It was inspired by the untimely death of a family member. A Live Oak tree, with limbs reaching to improbable lengths, honors the life of a dreamer who didn’t seem to accept the limitations of life. Wayne will be showing at the Festival of the Masters at Downtown Disney in Lake Buena Vista, Florida on November 13th through 15th. This exclusive show should be very good. Just to apply to be juried into the show, the applicants must have won a major award at a major art show last year. 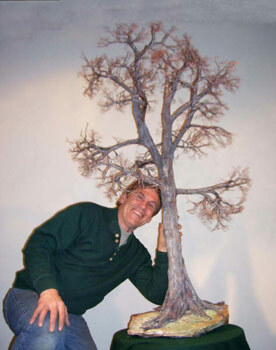 If you are in Chicago December 3-6, Wayne will have a complete showing of his Signature Trees at the One of a Kind Show at the Merchandise Mart. Wayne Trinklein was the featured artist at Belleville Art on the Square, the consistently top ranked fine art show in the country by Sunshine Artist Magazine. A wonderful 2 page article about him and his work was published in the newspaper. Click here to download a PDF of the article. Wayne was the featured artist in Cityscapes Magazine. The influence of his family in his tree characters was highlighted. Download the article. Wayne was the featured speaker at the unveiling of his sculpture for the City of St Charles Bicentennial Year. The sculpture named "Heart on the River" stands over 8 feet tall on its walnut pedestal, and features three trees at a river’s edge. It is on permanent display at St Charles City Hall. December 2008 – Six major awards for 2008! 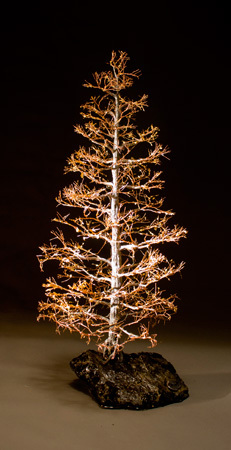 A new tree has recently been added to the Signature Series line, the Languid Lover. 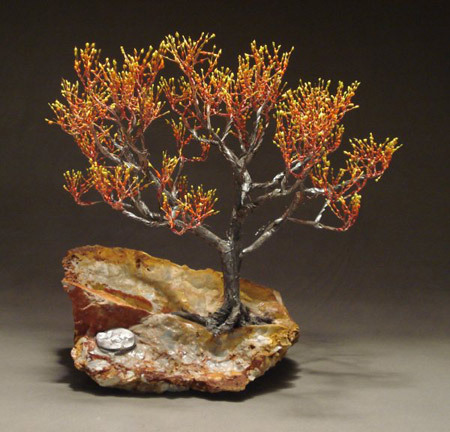 This tree depicts the easygoing days of summer. It and several others from the series can be viewed in a lovely fine art gallery in historic Long Grove, Illinois at the Woodland Grove Gallery. Trinklein recently received a Merit Award for Sculpture at the highly acclaimed Arlington Heights Fine Arts Festival in Chicago.